How ‘British’ are Crossrail trains? Siemens was at the centre of an intense row in 2011 when it was awarded a £1.5 bn contract to build 1,140 train carriages [for Thameslink], ahead of Bombardier’s plant in Derby, wrote the Daily Telegraph’s Nathalie Thomas (28 Jan 2014). The Thameslink trains are being built in Uerdingen, Germany, and their UK content is low. […] Steve Scrimshaw, managing director of rail systems for Siemens, said he expected future competitions for UK contracts to include a heavy emphasis on British jobs following the row over new trains for the busy Thameslink commuter line. The bidding framework for the Thameslink train contract was created by the last Labour government. After Siemens was awarded the Thameslink contract, Bombardier announced that it might close down its Derby factory, unless it received enough orders. In July 2013, Siemens withdrew from the Crossrail 1 rolling stock competition. In February 2014, the government announced Bombardier had won the Crossrail 1 order. The trains will be manufactured and assembled at Bombardier’s plant in Derby. The Department for Transport (DfT) said Bombardier’s contract would support 760 manufacturing jobs and 80 apprenticeships. When Bombardier lost out to Siemens for the £1.6bn Thameslink contract, it put the future of the Derby-based train maker in doubt and raised fundamental questions about the government’s support for manufacturing. Some claimed it was unthinkable that countries like Italy, France and Germany would award such a huge contract to a foreign firm and risk losing a fundamental capability like train manufacturing. A review of government procurement followed. That has led to a wider interpretation of European Union state aid rules. Contracts had tended to be awarded on a narrow value for money basis. Now broader issues are taken into account including the impact upon the supply chain, support for apprenticeships and the amount of the money to be spent in the UK. It is understood Bombardier was a clear winner of the Crossrail contract. The government insists it offered the best trains at the best price. At the Labour and Conservative parties, the Department for Transport, Hitachi, Siemens, and Bombardier, the PR emphasis may now be on ‘British jobs’. But according to Crossrail Ltd, the Class 345 trains for Crossrail 1 are 27% British by value. So what is the GB content of the Class 800, AT200, and AT300 trains, which are to be assembled by Hitachi at a factory at Newton Aycliffe? Neanderthals in the House of Lords have packaged together every half-backed [sic] snake oil claim about HS2 that it is possible to find in a report that accuses the Government of failing to make a convincing case for the £50 billion project (wrote The Chamberlain Files’ Paul Dale). But how would building a £20+ billion high speed railway between Birmingham and London reverse forty years of second-city economic decline? In the late 1960s, there was only one motorway connection between London and Birmingham, and fewer (and slower) train services than there are today. So one might expect that in 2015, with the improved connectivity from the M40 and the West Coast Very High Frequency train service, Birmingham’s relative productivity would be higher than in the 1960s and 1970s. But in the last forty years, a large productivity gap has opened up. This month’s Lords Economic Affairs Committee report on HS2 concluded that the scheme would primarily benefit London, rather than provincial cities. Interestingly enough, Alan Wenban-Smith’s 2009 report for the the high speed lobbying company Greengauge 21 stated that “economic theory predicts that better transport between two regions or nations will tend to work to the competitive advantage of the stronger area”. The Lords Economic Affairs Committee report on HS2 was highly critical of the entire scheme, but suggested that if did go ahead, it might be less silly to terminate the line at Old Oak, rather than Euston. Needless to say, the cost and disruption savings would be enormous. The HS2 Ltd design for Old Oak was for a through station, to Euston and HS1. A terminus of the same capacity as Euston HS2, would require more land, for perhaps 12 platforms. But how much more? ‘HS2 will boost local economies along and beyond the route’, according to the CBI. But surely, there must be a question mark over how much a bunch of HGVs and men in orange trousers could really ‘boost’ towns and villages in Buckinghamshire, Warwickshire, etc. 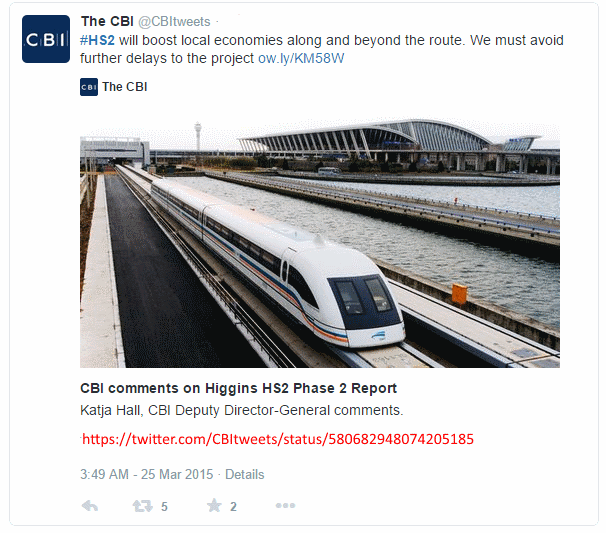 Sadly, the CBI don’t even seem to be able to distinguish between high speed rail, and a maglev. applying a BIS Tender Price adjustment to the cost of HS2 would give a Q1 2014 equivalent figure of £56.6 billion. “At £50 bn HS2 will be one of the most expensive infrastructure projects ever undertaken in the UK but the Government have not yet made a convincing case for why it is necessary. “The Committee are supportive of investment in rail infrastructure, but are not convinced that HS2 as currently proposed is the best way to deliver that investment. The Government are basing the justification for HS2 on two factors – increased rail capacity and rebalancing the UK economy; we have not seen the evidence that it is the best way to deliver either. “Overcrowding on the West Coast Main Line is largely a problem on commuter trains and on long-distance trains immediately after peak time on Friday evenings and at some weekends. The Government have not carried out a proper assessment of whether alternative ways of increasing capacity are more cost effective than HS2. “Full information on railway usage has not been made publicly available by the Government on grounds of commercial sensitivity. The plausibility of the Government’s claim that there are current long distance capacity constraints and also its forecast of future passenger demand are difficult to assess without full access to current railway usage. The investment of £50 bn investment of public money demands nothing less than full transparency. “In terms of rebalancing, London is likely to be the main beneficiary from HS2. Investment in improving rail links in the North of England might deliver much greater economic benefit at a fraction of the cost of HS2. One might also recall that in January 2015, the House of Commons Public Accounts Committee said they were “sceptical” as to whether HS2 could deliver value for money. But judging by soundbites from the CBI and the Labour party, everything about HS2 is hunky dory. Of course, many of the shortcomings of HS2 have been explored in depth, by the Beleben blog. Sadie Morgan, of dRMM de Rijke Marsh Morgan Architects, has been appointed ‘chair’ of the HS2 Design Panel. […] She said: “The fact I am an architect gives me a good oversight – because this role is all-encompassing, from ticketing to toilets. […] Ms Morgan’s appointment coincides with the publication of HS2’s Design Vision document, which aims to provide a framework going forward to engineering, architectural and design teams. […] “We have to make sure everything works intuitively and well for everyone and all elements are fit for purpose but sensitive to context. “The overriding feature is what good design looks like. What good design looks like, seems to depend on who is doing the looking. HS2’s Head of Architecture, Laura Kidd, has some strange ideas on the topic. She was involved with the design of the Channel Tunnel Rail Link (HS1), which resulted in ‘Tesco value viaducts’, and carbuncles such as Stratford International station. Business trends at sea mean the HS2 rail plan is essential, according to HS2 Chief Information Officer James Findlay. When a ship such as Globe unloads (it takes 24 hours), its load would form a single line measuring 72 miles, Birmingham to Manchester as it happens, and the next phase of HS2. “The ports at London and Southampton are being dredged for the new mega ships, so the challenge is the ability to distribute the loads. The ability to interface are critical to our survival and that requires a lot of strategic thinking about the hub cities in the UK.” While politicians try and sell HS2 to the public with everything but the truth; Findlay deals in facts and he knows the facts. Not just because he’s a well aligned CIO, but because he has a heritage on the seas, having been IT and projects leader at the Maritime and Coastguard Agency for close to a decade and before that a career in ports and defence. To this day, the coast plays a major part in his life, and he sees what’s happening on our waves and to our demands of our economy. “Over the next 10 years we will be at peak capacity on the existing rail network,” he says returning to dry land. “HS2 provides a relief to primary freight traffic. We won’t build more roads,” he says with knowledge, as Findlay doubles up as Technology Leader for the Department for Transport. “Network Rail has been re-engineering some of the lines through a process of dropping the lines,” but as he explains, because the UK was the first adopter of rail networks, the nation is lumbered with a legacy of Victorian lines that can’t take the growing capacity of local, intercity and freight rail. A new rail infrastructure is required. So what is the relief which would be provided by HS2 to primary freight traffic? Careful scrutiny of the evidence suggests the uplift in railfreight capacity would be, at best, minimal. […] there is good reason to believe that 3 additional freight paths per off-peak hour on the WCML corridor would be compatible with the HS2 Phase Two service set out in the PFM assumptions report. 3 additional freight paths per off-peak hour on the WCML corridor would be compatible with the HS2 Phase Two service set out in the PFM assumptions report. And 3 additional freight paths per off-peak hour on the WCML corridor would be compatible with no HS2 service at all. Because 3 is the hourly two-way number of freight paths currently allocated on the WCML, but not used.